Turkey in the crock pot? It goes against every traditional picture in my mind’s eye. But I’ve been wanting to try this recipe because as much as I love Thanksgiving, preparing the Thanksgiving feast is not for the faint-hearted. I still can’t believe my grandmother used to prepare the entire meal by herself, not to mention that her table was decorated beautifully and the food was always amazingly delicious. Many years later, I am lucky enough to get help from other family cooks who jump in and make many of the side dishes and trimmings. But the turkey is still my responsibility. With Slow Cooker Turkey Breast, the meat is moist and juicy. This is pretty much a guarantee. The gravy created in this presentation was the some of the best homemade gravy I’ve ever tried, second to my grandmother’s. And did I say how moist and tender the turkey was? Seriously, the bite on this fork fell apart as soon as I lifted it off the plate. Here is my final impression of this option for cooking the Star of the Thanksgiving feast – As mentioned, the turkey was super moist which is always a relief. Classically flavorful and a gravy that was perfection. But keep in mind if you’re thinking this is just a dump in the crock pot and forget it recipe, this is not totally the case. There is still a bit of pre-work involved to reach success. In order to get the delectable gravy from the slow cooker, it requires making a mirepoix (carrot, celery and onion) and adding some flour that is then browned with the aromatics before placing everything in the crock pot – easy but still took some time. Just saying. And you still have to carve the thing – which is actually my biggest undoing… even with years of practice. But that’s an entirely different issue. 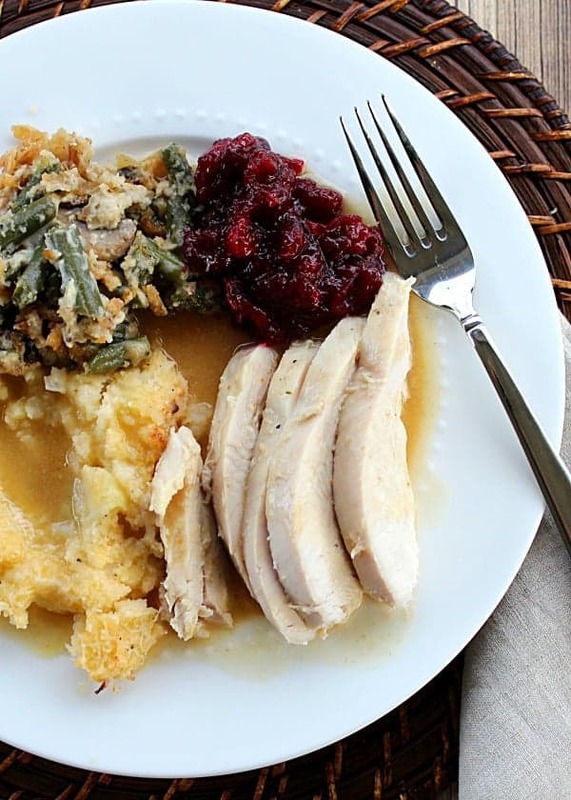 If you’re feeding a small group of no more than eight guests and you want a sure-fire method for juicy turkey and perfect gravy, plus maybe you like the idea of keeping the oven free for baking your side dishes, then this is your recipe. 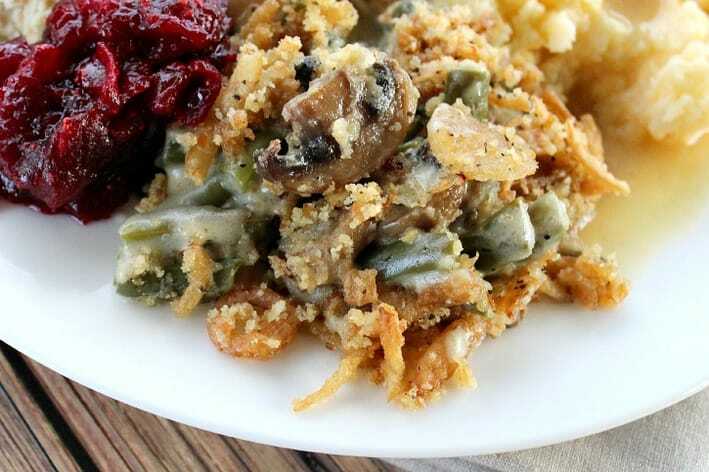 And speaking of side dishes, try my fool-proof Green Bean Casserole that can be made months ahead or the day of the feast and this recipe for Last Minute Cranberry Sauce. 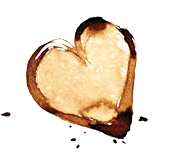 Talk about classic and delicious recipes. 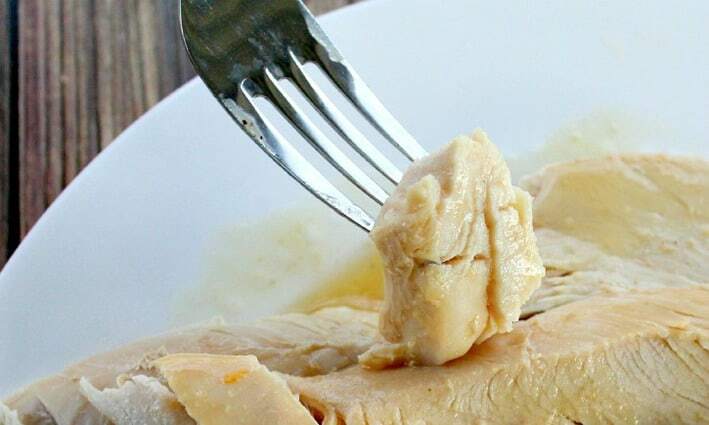 There you go, try these whether you make the Slow Cooker Turkey Breast recipe or not. 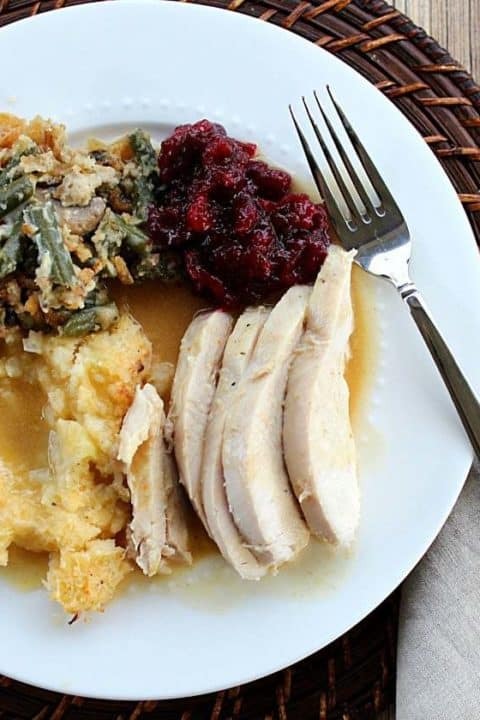 This recipe will yield moist turkey every time and a deliciously flavorful gravy. Melt butter in 12-inch skillet over medium-high heat. Add onion, carrot, celery and garlic. Cook until the onion is softened and lightly browned, about 10 minutes. Stir in flour and cook until golden brown, about 2 minutes. Stir in 1 cup broth, scraping up any browned bits and smoothing out any lumps; transfer to slow cooker. Stir in remaining 2 cups broth, wine, thyme sprigs and bay leaves into the slow cooker. Season the turkey breast with salt and pepper and place, skin side up, into slow cooker. 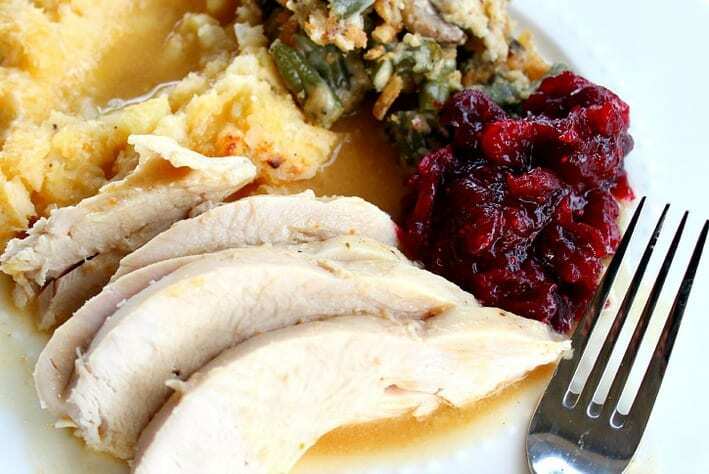 Cover and cook until turkey reaches 165 degrees on instant-read thermometer, 5 to 7 hours on low. Transfer turkey to cutting board, tent loosely with aluminum foil, and let rest for 20 minutes. Let braising liquid settle for 5 minutes, then remove fat from surface using a large spoon. Strain braising liquid into saucepan, discarding solids, and simmer until thickened, about 15 minutes, adding more flour diluted in water, if necessary. Season with salt and pepper to taste. Recipe adapted from America’s Test Kitchen Slow Cooker Revolution. I love the idea of doing the whole thing in a slow cooker – it sounds SOOOO much easier. Great tips!